* Leaves fine-toothed, elliptic, hairless, 2-6". 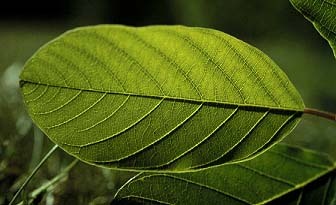 * Veins follow leaf edges. * Twigs hairless, inner bark of older stems is yellow. * Fruits small, red to black, fleshy berries, with 2-4 seeds. * Flowers May - July. * Fruits ripe August - September. * Habitat: Forest edges, thickets. * Range: Both eastern and western United States. * Buckthorns are sun-loving, fast-growing species that quickly establish in thinned or disturbed areas of forests. To prevent the takeover of an area by buckthorns, which do not grow rapidly in the shade, thinning of shrubby areas should be done in stages. 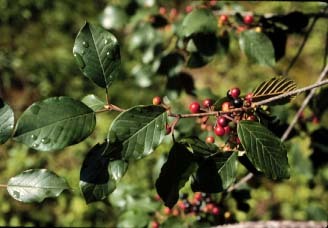 When forest canopy vegetation is always maintained, shade inhibits the growth of buckthorns and other invasive species.